The latest release from Nikko.Z's Dopamine Music finds the label showcasing new interpretations of Eric Lune's 'Matter Of Fact' EP. Released in January of this year it was the Australian artist's debut for the Greek imprint, which followed impressive outings on MNL and Timeless Moment to round out 2018. Now Dopamine Music calls upon Paul Angelo and Don Argento and Christopher Fafa to reinterpret the tracks. The lone interpretation of 'Matter Of Fact' is provided by Paul Angelo and Don Argento who make their label debut here. The Cyprus based duo have achieved remarkable success over the last calendar year. EP projects for Soundteller Records along with a remixes for Beat Boutique, Movement Recordings and Yin highlight their discography. Now making their Dopamine Music debut in a big way they put a unique twist on 'Matter Of Fact'. Perhaps best known for their peak time creations the duo offer something a touch deeper here. Their dark, rhythmic core has become a trademark; smooth, chuggy and wondrously groovy it lays the perfect backbone for finely tuned percussion, distinctive stabs and a growling bassline to work their magic. Not without emotive moments, Paul and Don craft a break which draws on the sensibilities of the original. Cinematic in nature, icey pads rise to prominence, engulfing the cavernous centrepiece, before fully saturating your pleasure centres as the beats drop for a smooth finale. The release concludes with Christopher Fafa also making his label debut and providing the lone interpretation of 'Within'. The Greek artist has found a home on 3rd Avenue and Soundteller Records, the latter of which released his lone single of 2018 entitled 'Cerebro'. Perhaps long overdue, Christopher now makes his first appearance on Dopamine with a stunning rendition of 'Within' to close the release out. Smooth, rolling and full of great rhythmic hooks, it's got a superb dance floor sensibility from the outset. The esoteric themes which drift over the framework push it into brilliant territory though. Coming to full fruition during the main break as delicate tones and clustered melodies converge in a perfect sonic marriage, before a tasteful build precedes a charming finale. 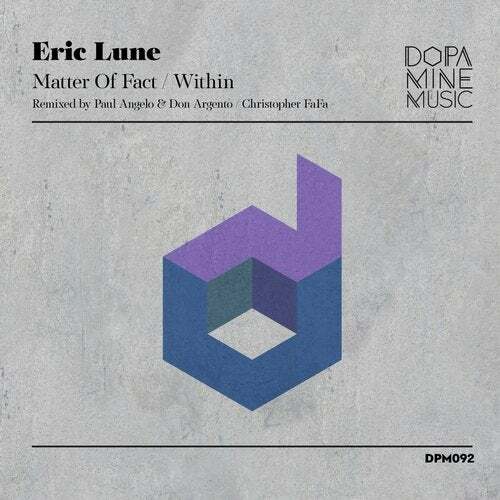 A superb interpretation from Christopher which rounds out a top notch remix edition for Eric Lune's 'Matter Of Fact' EP. Don't miss it.